Its way more easier method of cleaning your baby's untidy bottles by popping it in the sterilizer. I couldn't find any weakness in it as it really cleaned up my baby's bottles. I first tried these tablets after getting few samples from Emma's diary packs and loved it forever and ever since its always on the top of my shopping list. They really cleaned the bottles so well. A must try for all mums you'll fin them easy to use as you just need to pop a tablet into the sterilizer and let it blow into bubbles only to find clean stuff out there! I love using the sterilising tablets I do all my sons doddies with them and several other teething toys! The tablets smell beaut and refreshing so easy to use aswell! It’s so easy to use and saves ££. I recommend this product along with The sterilising unit. Amazing little thing. A pack goes a long way for me. So far it’s been so good using these tablets. Tablets are so straight forward to use, pop into water and they are ready to go. None of this fussing about measuring or mixing! I was looking for something to sterilise my babies matiriel easily. Boiling the bottles was leaving a layer of powder on the bottles. I don’t really like to use the microwave and it’s quite similar to boiling the items. 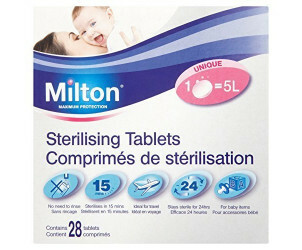 With the milton tablet I am sure that everything is gonna be clean and sterile and it’s so easy to use. I just need to fill a bucket with water, add the tablet and leave the items in there for a little while and it’s done. I even let them overnight so it’s ready to use in the morning. I don’t even use a full tablet every time. I just fill my bucket with 2,5L and add half of a tablet. I just found two inconveniences. The first is that this way of sterilisation leaves an odour on the items my children had to get used to. The second is that when tearing the tablets, I accidentally ripped the paper of the other tablets. I love this product. Not only can they be used for sterilising but I use them in my prep machine when it needs a clean and they work a treat, much better than any other product I have tried. Simple instructions and the packaging allows for just one to be used at a time. You only need one tablet a day in the steriliser so the box lasts a while. It couldn't be easier to use, open the pack, straight in to the sterikising unit and let it break up and then it's ready to use. Great for sterilising things when travelling/holidays where there isn't a microwave/socket or dishwasher. Can find tablets/sterilising fluid cheaper but a lot of them you need to use more tablets/fluid per say so doesn't necessarily always work out cheaper. Things that I have sterilised always smell clean too - which to me is a very big plus! I used these when my son was younger there excellent smell lovely and makes bottles dummies smell nice and clean and don’t damage the bottles. Also used these when we went on holiday and they came in very handy! 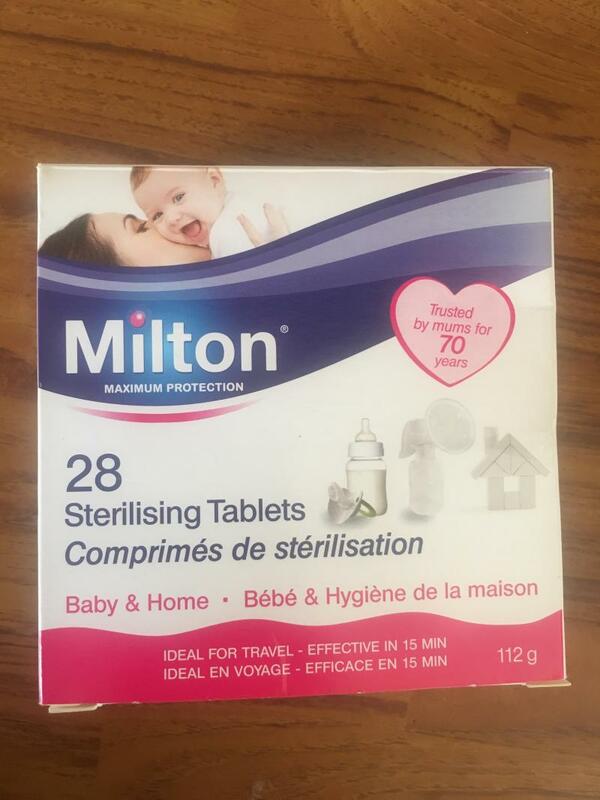 I tend to use the Milton steriliser fluid at home but that’s purely out of preference. These do just as good a job and really simple to use. These are fab for taking on holiday as They take up less space. Easier to use then fluid as there is less mess. Just drop a tablet into water let dissolve and go. Great for traveling and easy to store. I took these on holiday and they were great as they don’t take up much bag space or weight. They just fizz in the water and you just pop in your bottles. Nice and quick. Perfect size for carrying about. I don’t remember any weaknesses. I used these throughout my baby’s time bottle feeding. They were perfect for sterilising his bottles. Perfect size for carrying about, rather than a large bottle of liquid. Has a very chlorine smell to it. I used to purchase these for around £1.50 and it'd virtually last me an entire month as I used to use them with the milton cold water sterliser. As I only used to sterlise the electrical breast pump parts I only used to use half the amount of water. So these tablets were great as I would normally break them up in half so would last twice as long. The only negative thing I have to say is that the tablets gave the water a chlorine smell other than that it'd sterlise the equipment for 24 hours at a time. These tablets are easy to use. Can be used for a number of things. I love these. I used them for everything when my lo was born. And now I have them in the cupboard for when she's poorly and I need ro give her drinks bottle and extra clean. I also use on her bath toys one and a while. They are easy to use, they have been handy to take with me when I’ve gone away as they don’t take over a lot of space and I know that everything is thoroughly cleaned and sterile. Even though not their intentional purpose they’ve also helped remove stains when I’ve let stained baby gros soak in them- they’re brilliant. 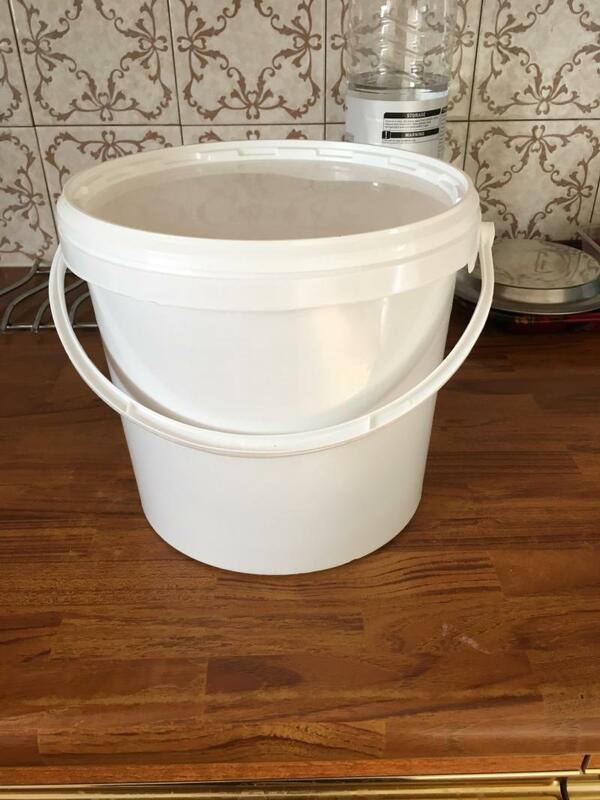 Easy to break up and makes everything clean and ready for baby to use will be using this again as this is a brilliant way to clean baby stuff easy and quickly . I bought these to use with a travel sterilizer which I used while on holiday. The tablets where easy to use came with full instructions. I broke the tablets as I didn't need to use a full one as it was only a small sterilizer. My baby is exclusively breast fed, I regularly pump and give a bottle for dad to feed so I love using milton it's the best product for cold sterilisation. So quick and easy to use. I have had to use this since my son was few weeks old to steralise he is bottles. 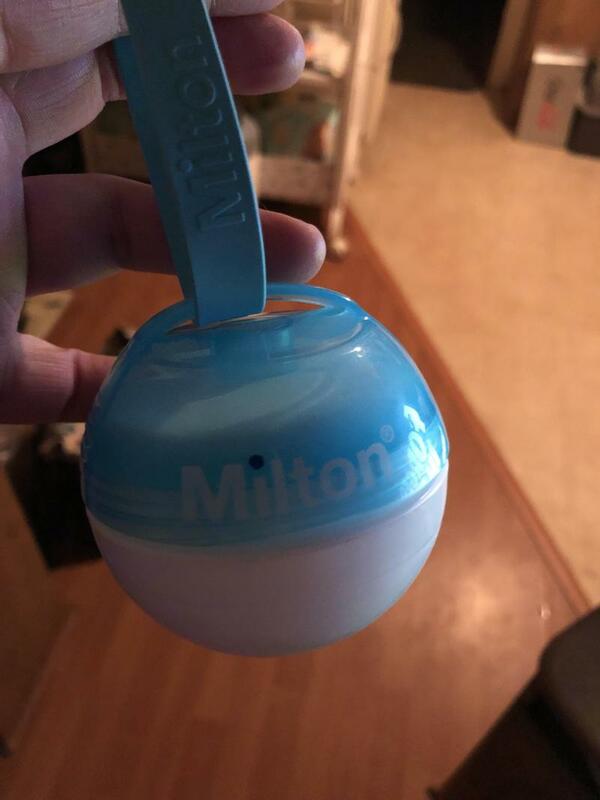 I have always used Milton in the past and swear by it. 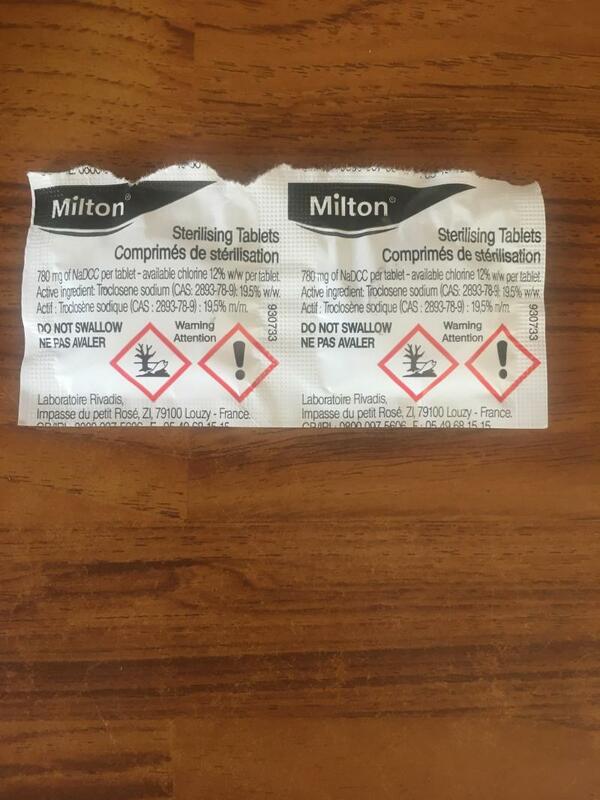 They good clean and quick to use I have tried other sterilising brands but keep coming back to Milton as I find it is the best. 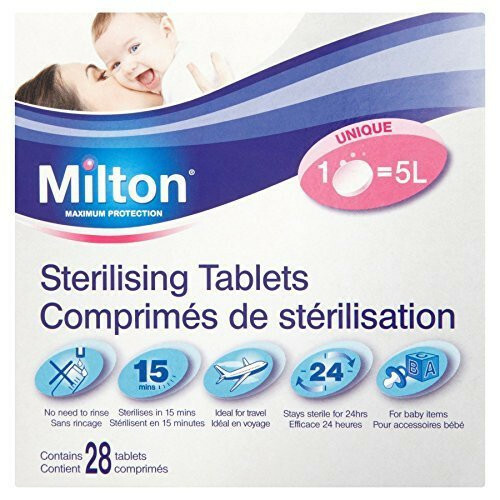 Milton Steriliser Tablets are the ideal companion to ensure your baby's health and safety, thanks to their safe, easy and highly effective cold water sterilising process.